Exam and dissertation season is just on the horizon and with the exciting arrival of our new task lamp collection we’re looking at how you can create a flowing interior throughout your home, with the use of styled lighting and accessories for those sometimes forgotten areas of the home. Study areas and home offices don’t have to be cold and clinical with a plain desk, office chair and flexi lamp. 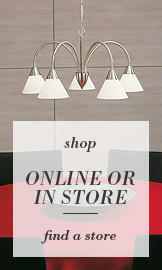 These days you can find practical lighting and accessories that are on trend, fashionable and won’t break the bank. If you have a particular taste when it comes to interior design and want this look to flow from one room to another, such as the dining area into your home study room, then look no further. Today’s post concentrates on the popular industrial trend, this look just gets better and better with homeowners going back to their roots to create a rustic, stripped back and laidback feel. Rummaging through second hand shops, gathering trinkets at vintage fairs and mooching in good old charity shops have become the in thing lately. The industrial look can easily be adapted to small offices and home offices with a few simple accessories. Our new range of practical task lamps features a selection of industrial and vintage designs that will sit comfortably in any home whether you’re a sucker for salvage inspired design, fancy some vintage flare or simply want to indulge your industrial side. 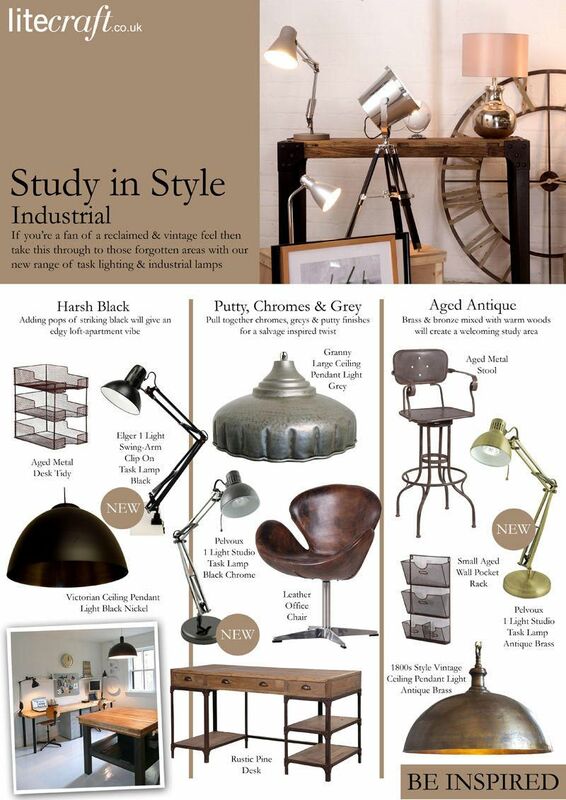 For this weeks look book we’ve pulled together some key industrial style lighting, furniture and accessories to give you home offices and studies that reclaimed industrial feel. Just in time for the study season. A must for industrial interiors is the use of black, giving that edgy warehouse look with some pops of black will create a loft-apartment vibe. Ideal for open planned apartments and converted attic spaces. Our new Elger Task Lamp in Black not only features a classic black finish, it also boasts a detachable base and a clamp mechanism which enables the lamp to be attached to a table or other work surfaces for more mobile use. The round shade produces a wide scope of light that, with the adjustable and pivoting design of the arm, allows for a more directed and focused light. This fitting is also available in silver and white. We’ve teamed this task lamp with our Victorian Ceiling Pendant from our highly anticipated new lighting collection. The distressed black nickel finish of the pendant compliments the lamp. Add a restored computer desk to complete the look. For a more salvage and rustic inspired den choose steel and chrome finishes with warm worn leather textures for contrast. Our Pelvoux Studio Task Lamp features an iconic angled design in three classic finishes. We chose our Black chrome option for this look book and teamed it with out brand new Granny Ceiling Light which is the ultimate in industrial design with a worn effect finish and rigged edge detail. Finally add some warmer tones and choose a brass or bronze finish. Copper is also a great tone for a warmer interior. Warm metals work well against exposed brick walls, in particular red brick walls. Again we’ve chosen our Pelvoux Task Lamp but this time in our Antique Brass finish. With the success of our Hobby Desk Lamp last year we think this more classic adaptation will be a big hit. Inspired by iconic angled lamps, our Pelvoux Task Lamp features a focused and direct pool of light and can be adjusted and angled with its practical joint mechanism, making this an ideal addition to any home office or study room. To compliment we paired this with out 1800’s Vintage Ceiling Pendant which features a hammered rustic brass finish. When lit this pendant gives a beautiful orange glow that creates a warm ambience. For industrial desk and study accessories choose rustic chicken wire organisers and storage boxes. Old wooden apple carts make great storage boxes or shelves. Wire waste paper bins will also add to the industrial feel. Vintage filing cabinets will give a great nostalgic finish to a room whilst providing extra storage. Finally, choose a rustic computer chair to complete the look, we recommend scouring second hand stores for old schoolhouse swivel chairs, adjustable French Bienaise chairs or classic Iron Cello chairs. What do you think of this industrial home office trend?